The GTArcade platform will begin supporting Boku Mobile Payments starting Sep. 27th. German and French players, and players in the U.S . who use Sprint mobile now have another mobile payment option: Boku (Pay by Mobile)! 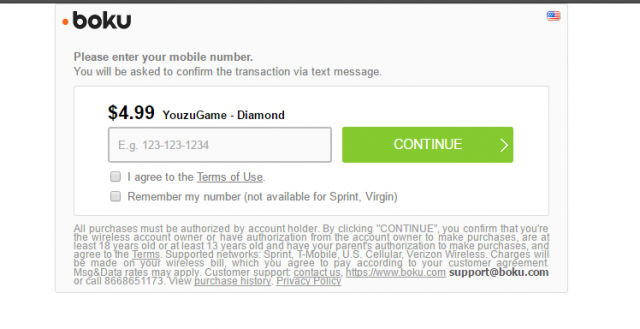 Players in the U.S. who are on Sprint now can use Boku Payment under the SMS Billing category. For German and French players, Boku Payment option will be available on the GTArcade website when the language is switched to German or French. Boku, headquartered in San Francisco, CA, provides a mobile payments platform enabling consumers to pay for goods and services using their mobile phone number, with purchases billed to a consumer's mobile network operator bill. This form of mobile payment, also referred to as carrier billing, enables consumers who may have a mobile phone, but no credit card or traditional bank account, to make purchases online, as well as customers who simply find carrier billing a simpler way to transact.